Irish Impressionist Artist, Portrait Painter: Biography & Paintings. A masterpiece of plein air painting. Born in Belfast, but soon orphaned, Lavery spent his early years on his uncle's farm. At the age of ten, more family problems led to his relocation to Scotland where he attended the Haldane Academy in Glasgow. Afterwards he worked as an apprentice photographer and, from this experience he developed an ambition to become a portrait painter. He travelled to Paris in 1881, where he studied drawing at the Academie Julian and fine art painting at Colarossi's studio. In 1883, he spent time at the artists' colony of Grez-sur-Loing, and made friends with the older Irish artist Frank O'Meara as well as the French painter Jules Bastien-Lepage, both of whom influenced his painting. 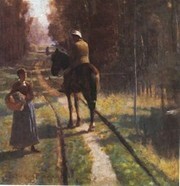 In 1883 he exhibited his first French landscape, Les Deux Pecheurs. A perfect example of Lavery's naturalism. During his stay at the artists' colony, he took to landscape painting in the open air as he absorbed the ideas and plein-air methods of the Barbizon and Impressionist landscape school, all of which were high fashion at the time. One of his favourite subjects was the river Loing - especially the local stone bridge - which appears in several of his famous landscape paintings. In 1885, Lavery returned to Glasgow and became a leading member of the Glasgow School of Painting (1880-1915), which - along with the slightly later Scottish Colourists - introduced Post-Impressionism to Scotland. 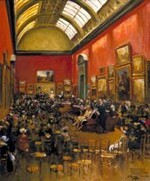 In 1888, he was given the commission of painting the state visit of Queen Victoria to the Glasgow International Exhibition. This task launched him as a society painter and he moved to London soon after where he set up a portrait studio in Cromwell Place. In London he became acquainted with James McNeill Whistler and was noticeably influenced by him. The style of his society portrait art won him many admirers. He also spent time in Ireland where in 1907 he was duly elected a member of the Royal Hibernian Academy, Dublin. In 1914, like his fellow Irish artist William Orpen, Lavery was made an official war artist, but ill-health and a car accident ruled out any active duty. It was during this time that he became friendly with the Asquith family whose portraits he painted along with such pictures like Summer on the River. After the war, Lavery received a knighthood and then in 1921 was elected to the Royal Academy. He also became more involved with Irish art and politics. Lavery always saw himself as a recorder of events, thus, in 1921, during the Anglo-Irish negotiations over the Irish Treaty, he painted numerous portraits of the members of the Irish delegation, and after the death of the Irish Republican leader Michael Collins he completed Michael Collins, Love of Ireland. In the 1930s, he returned to Ireland for good and died in County Kilkenny, aged 84. Lavery first married Kathleen MacDermott, who tragically died of tuberculosis. In 1909 he married the beautiful Irish-American Hazel Martyn (1887-1935), whom he also outlived. The knowing look exchanged by Lavery and Hazel, makes this portrait an especially intimate composition. Lavery was obsessed by her beauty, and she appeared in over 400 of his paintings - see also the The Red Rose, below. One of her portraits was replicated on the Irish pound note until the 1970s. The Irish government invited Lavery to paint his wife's portrait for the punt in gratitude for the help the Laverys gave to the Irish political delegation in London, in 1921. Lavery eventually returned to live in Ireland, and died in Kilkenny in 1941. He is remembered as one of the greatest painters in the history of Irish art, not least because of his membership of the £1 Million Club. The highest price paid at auction for a painting by John Lavery was recorded in 2007, when his Impressionist painting, entitled The Bridge at Grez (1884), was sold at Christie's, in London, for £1,321,500. Other top works by Lavery, include: The Honeymoon (1921), sold for £915,200 at Christie's London (2006); Portrait of Lady Evelyn Farquhar (1912), sold for £748,000 at Sotheby's London (2007); and Finale (1885-87), sold for £599,200 at Sotheby's London (2004). For more, please see our list of the Most Expensive Irish Paintings.  For details of other fine art painters, see: Irish Artists: Paintings and Biographies.  For more about Impressionists like John Lavery, see: Irish Art Guide.